Some of the people cautioned that Trump hasn’t made his final decision, and it’s possible the administration may enact the duties in installments. The U.S. has so far imposed levies on $50 billion in Chinese goods, with Beijing retaliating in kind. 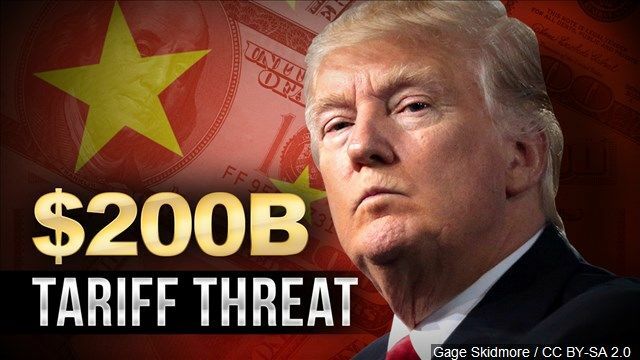 The imposition of the $200 billion tranche would be the biggest so far and would mark a major escalation in the trade war between the world’s two largest economies. It is likely to further unnerve financial markets that have been concerned about the growing tensions.China has threatened to retaliate by slapping duties on $60 billion of U.S. goods. The Trump administration is finalizing the list of Chinese targets and tariff rate, which could range from 10 percent to 25 percent, following six days of public hearings earlier this month. Bob, you think a terrible trade imbalance with China and them stealing US technology is good for the USA? What is the matter with this BAFFOON? Idiot #1 in my opinion. Bob was crying on a different page as well. Bob must plan on selling everything in the next three days. I have an uncle Bob that is a complete moron. Is this you uncle Bob??? My god it hasn't been that great the last three yrs anyway. Bob loves mediocrity.